A New Jersey woman crashed her car yesterday on a gravel path meant for walkers and bicyclists. 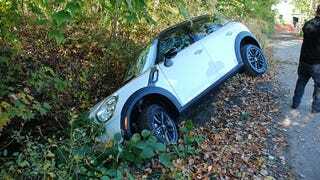 She mistook the path for a proper road, almost certainly because she was driving a Mini. Technically, she was driving a Mini Countryman, a car that's more of a 'medium' than a 'mini' if I must be honest. Still, it seems clear to me that there was something about the nature of the car that had 25-year-old Yimo Xiao think that the Middlesex County Greenway was a road big enough to drive on. Metuchen Police Department Sgt. David Liantonio told NJ.com that the police have not declared the Mini at fault for the accident, stating "We have no idea why she decided to go down there." Xiao was not injured in the crash, nor has she been charged for the incident.